I don’t usually promote products, but I thought I’d share an inexpensive idea for a party favor or small gift. Purchased for $1 at the *Store Which Shall Not Be Named, these 3 oz. scented jar candles are affordable and come in a variety of fragrances. I have placed them on my Thanksgiving table as colorful, decorative party favors. This year, I purchased candles in apple pie, pecan pie, pumpkin spice, and pine scents. The scents and colors were perfect for Thanksgiving and Autumn! To make an easy party favor, stick a bow on top of the lid or fasten a ribbon around the jar, add a gift tag, and you’re good to go. 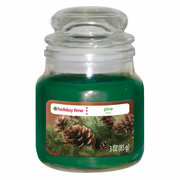 The candles also make easy holiday gifts for coworkers or others you want to recognize with a small gesture. Just place a candle in a small gift bag with some candy canes or wrapped holiday candies and a small card or gift card, and you can let someone know they’re appreciated without straining your budget. May your holiday shopping be stress-free! « ‘Tis The Season for Socialist Santa!